Prince Fielder’s gone. Ryan Braun might be gone for 50 games, pending his appeal of a suspension for taking a banned substance. Take that much pop out of any lineup, and you’ve got a team destined for meaningless baseball by August, right? In this case, not necessarily. The Brewers return plenty of offense. Even if Braun’s suspension is upheld, Corey Hart is an underrated hitter with 20-plus homers in four of the past five seasons; Rickie Weeks is one of the best offensive second basemen in the game; new addition Aramis Ramirez should provide ample sock; even new first baseman Mat Gamel could surprise in his first go-round as an everyday player. well, Gonzalez is going to make a ton of outs in even the most optimistic scenario. Ramirez played 149 games last year and the same number in 2008, but he played in just 206 games between 2009 and 2010. Healthy seasons for Ramirez and Weeks will be vital to the team’s chances, even if the pitching staff rings up big numbers. but he saw a lot more flyballs leave the park, and gave up a few big hits with runners in scoring position, enough to make his end-of-year numbers look pedestrian. Bet against Greinke ever winning another Cy Young in the loaded NL starting pitcher pool if you must, but the Brewers still got a front-line pitcher in their trade with the Royals. Between Greinke, the steady and underrated Gallardo and effective no. 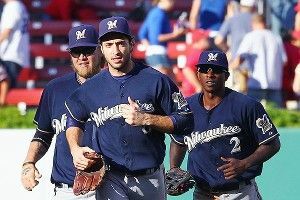 3 and 4 men in Marcum and Wolf (or vice versa), the Brewers can hang with any rotation short of Philly’s and maybe San Francisco’s. Gamel. A butcher at third base for years, Gamel’s path to the big leagues was blocked by that lousy D and Fielder’s beastly performance at first. Though Gamel’s glove could play below average at first, too, he’ll likely do less damage there than he would at third. That in turn could allow Gamel’s bat to do the talking. Lines of .309/.387/.511 and .310/.372/.540 at Triple-A over the past two seasons offer promise for strong numbers in Gamel’s age-27 season, which will double as his first full season in the big leagues. Braun doesn’t miss a beat post-suspension, Ramirez and Weeks combine to play 280-plus games, and Gamel hits right out of the gate. Gonzalez defrays some ugly defense at the infield corners, and the strong rotation and bullpen back-end delivers a bunch of 3-2 wins. Add it up and you get a Brewers team that makes it back to the playoffs, despite one gigantic offseason loss. Braun misses the full 50, Morgan returns to being a pedestrian player (albeit one with an excellent shtick), Ramirez looks old and can’t stay healthy, Axford accuses K-Rod of stealing his mustache wax, causing bullpen controversy, and the Brewers finish a distant third behind the capable Reds and Cardinals.